Bless their nest this Christmas with this charming nesting set of three designer cardinal boxes, topped with a keepsake ornament, and filled with a large assortment of holiday favorites! The ornament comes with a card ''Legend of the Bird's Nest'' explaining that who finds the bird's nest in the Christmas tree gets a year of good luck. A wonderful gift! 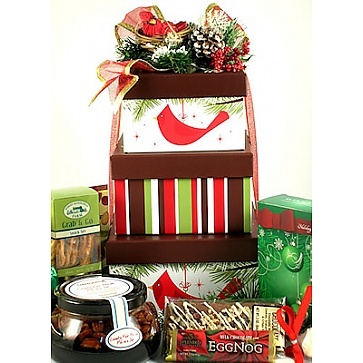 This 3-tier set of designer boxes will add charm to their holiday décor. It arrives adorned with holiday ribbon, pine accents and a keepsake cardinal ornament. This is one of our favorite new holiday gift towers and is sure to be one of those holiday gifts you send that gets remembered for a long time to come.